Author of the book, The Multiplier Effect of Inclusion: How Diversity and Inclusion Advances Innovation and Drives Growth, Dr. Byers is best known for leading and revitalizing Starbucks’ highly respected and successful D&I function and programming. As Head of Global Diversity and Inclusion, Dr. Byers developed and lead the company’s strategic direction to drive engagement, innovation and business growth. Prior to Starbucks, his impressive track record in large matrix multinational organizations included Cargill, where he led diversity programs throughout North America and a pioneering role as a transformational D&I leader at H.J. Heinz. At Heinz, he created the company’s global diversity and inclusion function from the ground up, creating and building model programs and practices. With 20+ years working in the field, Dr. Byers brings a diverse set of experiences and thinking to his D&I practice, including work in the nonprofit and education sector, as an organizational management consultant and as an adjunct professor at the University of Minnesota, Metropolitan State University and the University of Wisconsin. He holds a Ph.D. in Human and Organizational Development and a M.A. in Organizational Systems from Fielding Graduate University in Santa Barbara, California. His doctoral thesis focused on effective strategies for building support for diversity programs among senior leaders. As Dr. Byers has observed, “We’ve been working on diversity and inclusion for 50 years and we’re really not happy with where we’re at. That means we’re either not doing something right, or we need to do something different.” His thought-provoking presentations challenge old mindsets and inspire both individuals and organizations to stretch their imaginations and move beyond awareness of our differences and towards utilization that fosters innovation and growth. With a call to look within and leverage our cultural insights and diversity, Dr. Byers provides key strategies to increase personal, professional and organizational success. Whether you’re a D&I professional, an affinity group, or any organization looking to build a better culture while boosting the bottom line, you’ll leave inspired, empowered, and seeing diversity and inclusion in a fresh new light. Emmy Award-winning journalist Liz Claman got her start in business news by taking a leap of faith to co-anchor one of the pioneering business shows at CNBC. Now at Fox Business Network where she anchors Countdown to the Closing Bell, Claman has consistently led the network to the highest ratings in business programs. Her October debut on FBN included an exclusive live interview with Berkshire Hathaway CEO and legendary investor Warren Buffett. Throughout her tenure at FBN, Claman has conducted exclusive interviews with every U.S. Treasury Secretary since the Clinton Administration: Larry Summers, John Snow, Paul O’Neill, Timothy Geithner, Jack Lew, and Stephen Mnuchin. Claman has brought a roster of business leaders including JP Morgan CEO Jamie Dimon, Starbucks CEO Howard Schultz, Twitter co-founders Jack Dorsey, Evan Williams and Biz Stone, Google/Alphabet Executive Chairman Eric Schmidt, and Microsoft founder Bill Gates to Fox Business viewers as well as world leaders, including Israeli Prime Minister Benjamin Netanyahu and Ukraine President Petro Poroshenko. She was also the ﬁrst business network journalist to proﬁle Tesla CEO Elon Musk as he launched his aerospace manufacturing and transportation services company SpaceX. Trevor will set the tempo and align the mindset for the week as he kicks off the BISA Conference with a strong focus on creating an extraordinary mindset. Trevor is one of the countries most recognized and sought after mental conditioning consultants. In 2017, Trevor was named the "World's Best Brain Trainer" by Sports Illustrated. From Ft. Bragg to Harvard Business School, from elite Quarterbacks to top level CEOs. Moawads mission is clear - to motivate the motivated. Trevor is well known for being the mental coach to Seattle Seahawks quarterback Russell Wilson and has worked closely with prestigious NCAA Football programs and coaches, including Kirby Smart, Jimbo Fisher and Nick Saban. Moawad has been part of seven national championship finals. President of Pro/Elite Sports and Mindset at the prestigious Athletes Performance Institute (now EXOS in Phoenix, AZ). Moawad was raised in Washington State and is the son of world-renowned peak performance educator, the late Bob Moawad. Bob was an original contributor to 'Chicken Soup for the Soul' and is the former President of the National Association for Self-Esteem. As an athlete, Moawad was inducted into the Athletic Hall of Fame at Charles Wright Academy in Tacoma, Washington, and will also be recognized in 2018 as the Academy's Distinguished Alumni of the Year. He was an all-conference, two-sport athlete at Occidental College, the same school that produced both Jack Kemp and Barack Obama. At Occidental, Moawad received both his Bachelor's Degree in Politics and his Master's Degree in Education. Trevor Moawad is one of the countries most recognized and sought after mental conditioning consultants. In 2017, Trevor was named the “World’s Best Brain Trainer” by Sports Illustrated. From Ft. Bragg to Harvard Business School, from elite QuarterBacks to top level CEOs. Moawads mission is clear - to motivate the motivated. Trevor is well known for being the mental coach to Seattle Seahawks quarterback Russell Wilson and has worked closely with prestigious NCAA Football programs and coaches, including Kirby Smart, Jimbo Fisher and Nick Saban. Moawad has been part of seven national championship finals. Additionally, Trevor continues to support the U.S. Special Operations Community, Major League Baseball, the NBA, UFC and many other elite professionals. Prior to starting his own mental conditioning company, Trevor held multiple roles as both Director of Mental Conditioning and Director of the multidisciplined IMG Performance Institute (at the IMG Academies in Bradenton, Florida). More recently, he was the Vice President of Pro/Elite Sports and Mindset at the prestigious Athletes Performance Institute (now EXOS in Phoenix, AZ). 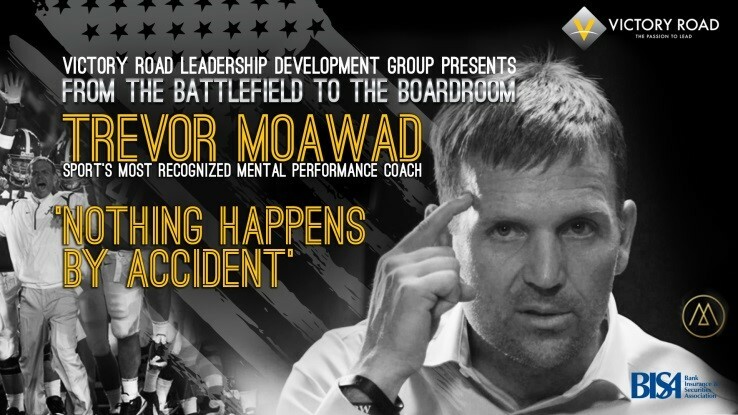 Moawad was raised in Washington State and is the son of world renowned peak performance educator, the late Bob Moawad. Bob was an original contributor to ‘Chicken Soup for the Soul’ and is the former President of the National Association for Self-Esteem. As an athlete, Moawad was inducted into the Athletic Hall of Fame at Charles Wright Academy in Tacoma, Washington, and will also be recognized in 2018 as the Academy’s Distinguished Alumni of the Year. He was an all-conference, two-sport athlete at Occidental College, the same school that produced both Jack Kemp and Barack Obama. At Occidental, Moawad received both his Bachelor’s Degree in Politics and his Master’s Degree in Education. Moawad yearly present’s the ‘Trevor Moawad Leadership Award’ at Occidental. These awards have been designated since 2015 to the top male and female athletes, who make an exceptional commitment to making their teammates better both on and off the field. Trevor continues to be a thought leader in the performance space, appearing consistently in the global media, including ESPN, SI, Fox Sports, NPR, USA Today, The Herald Tribune, Outside the Lines and a number of national, regional and local outlets.